Water-repellent sports jacket from P.E Nation. 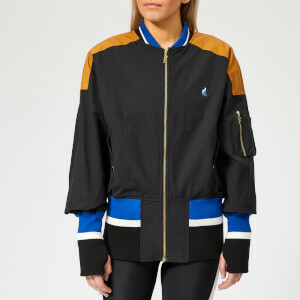 Cut from durable shell fabric with a relaxed fit, the 'Intensity' jacket showcases a sporty, athleisure aesthetic with an oversized panelled hood, checkerboard printed panels and contrast piping down the raglan sleeves, and elasticated cuffs and hem. The central zip fastening comes with a custom P.E zip pull to complement the design's custom drawcords and gold hardware throughout. Finished with P.E placement print on back hood and centre front chest. Fully lined.